The Dell is a little park situated between Warwick Place and Beauchamp Hill in Milverton, Leamington Spa. It is delightfully secluded like a sunken garden with a grassy area surrounded by trees, flowers and shrubs. It is maintained by Warwick District Council with the active support of Friends of the Dell and the GALS. Friends of the Dell was started by Pearl Braddock in 1996 to raise funds for new play equipment for younger children. In 1997 her new playground was opened by the Mayor, Cllr. 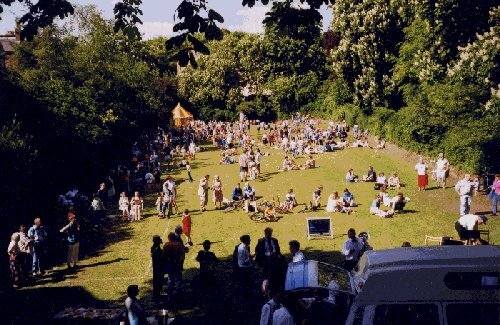 Chris Davis, and the following year the very first Party was held to mark the 50th anniversary of the Dell becoming a public park. You can see in the picture above how wild and impenetrable the slopes were at that time. Recently some pictures have come to light dating from those years showing not just the dark woods beyond the grass but also the real old climbing frames like the rocket that the older children loved. They co-existed with Pearl's new play items for a short while, but then disappeared for "health and safety" reasons. See the pictures here. Can you identify yourself or others? See the Dell here on Facebook, and here in Wikipedia.